After clearing up the path from Spital Station last week, this week we turned our attention to putting up our sign to let people know that the path leads into the park and nature reserve. Luckily we had a sign similar to those at other entrances already made and so putting it up it should be a doddle…. It actually took several volunteers all day to complete the task. (especially as Alan insisted on us getting it level!). Those not involved with the sign were all kept busy maintaining the pathways around the wild flower meadow near the Visitor Centre. Tim,Ron & Mike spent the morning taking measurements for river monitoring and doing a brief but fruitful plant survey. The others spent the morning clearing the path from Spital Station car park into the Reserve. In the afternoon we worked nearer the Visitor Centre, walled garden and pond, mowing paths , spreading woodchip, clearing rubbish etc. It all seemed to keep us quite busy. Winter came and went and the volunteers just kept on working, in all weathers – well we have actually had no snow at all this year, but we did get plenty of rain. Paths, fencing, coppicing, improvements in the Walled Garden, clearing the vista across to Babb’s Meadow from the viewpoint etc. – all sorts with plenty to keep us busy. The current major project is building a new Bodgers Shed (see details in the Projects section). This is very interesting and rewarding and I think we are all working very hard and enjoying doing it. 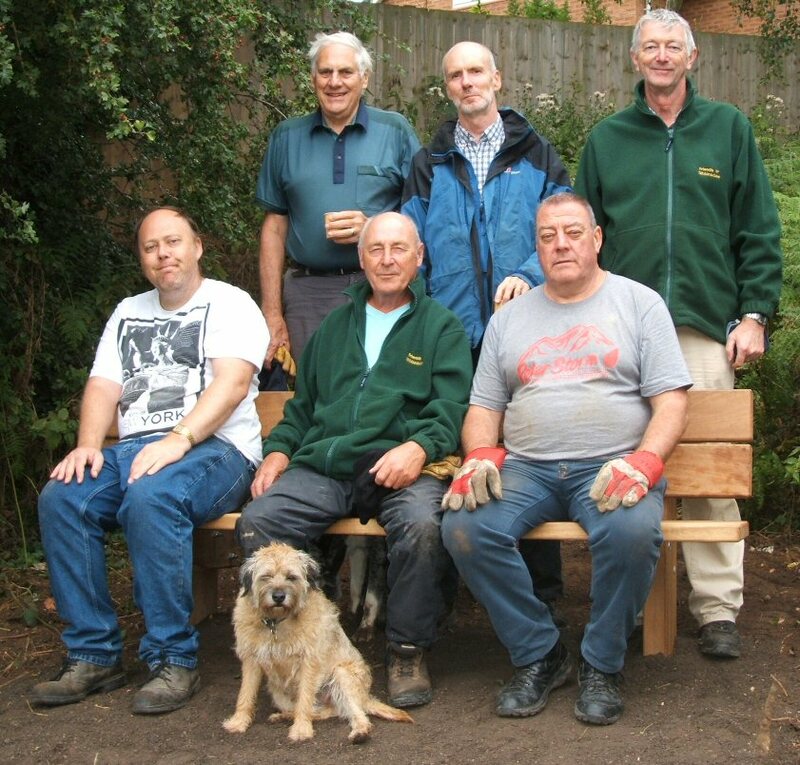 One job this week was the re-erection of a beautifully carved oak seat that was originally sited at Eastham Country Park. The seat was made by Bill Welch several years ago. Sadly Bill is no longer with us. There is more information about Bill and some more of his work still at Eastham. In its new home the seat looks great and brings a touch of real class the the garden. What a nice Summer. Lots of sunshine and warmth. The plants have been growing well, despite a relatively dry period. The volunteers have been active throughout. 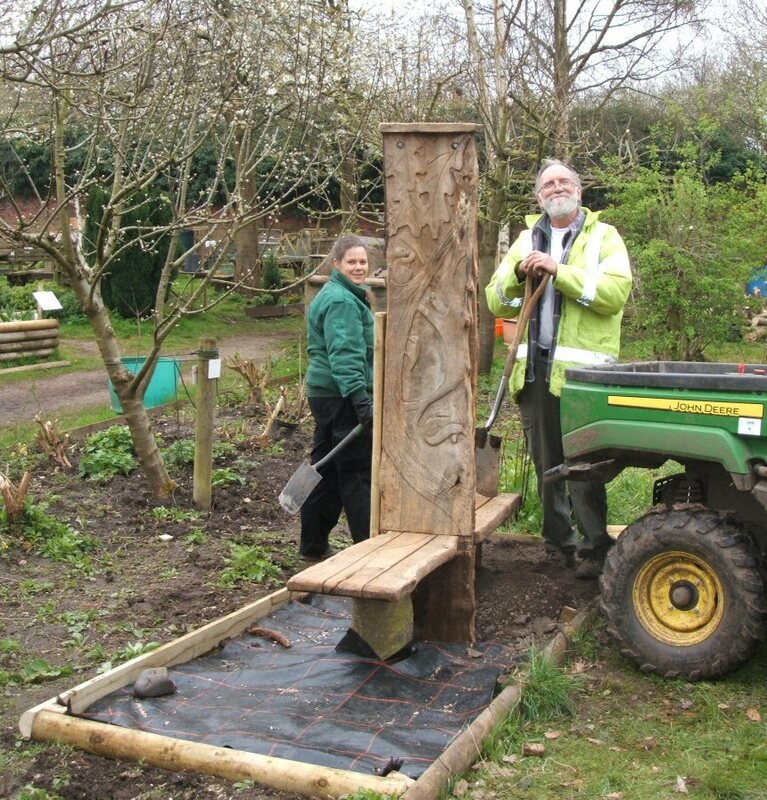 A major development has been taking place in the walled garden to make it more visitor friendly with an outdoor classroom area and places to sample home grown organic vegetables from the ‘incredible edibles’ project run by Eastham Day Centre. The regular volunteer team have also been working on the wild flower meadow near the car park and continuing with the ongoing fight to eradicate the Himalayan Balsam and Japanese Knotweed populations. 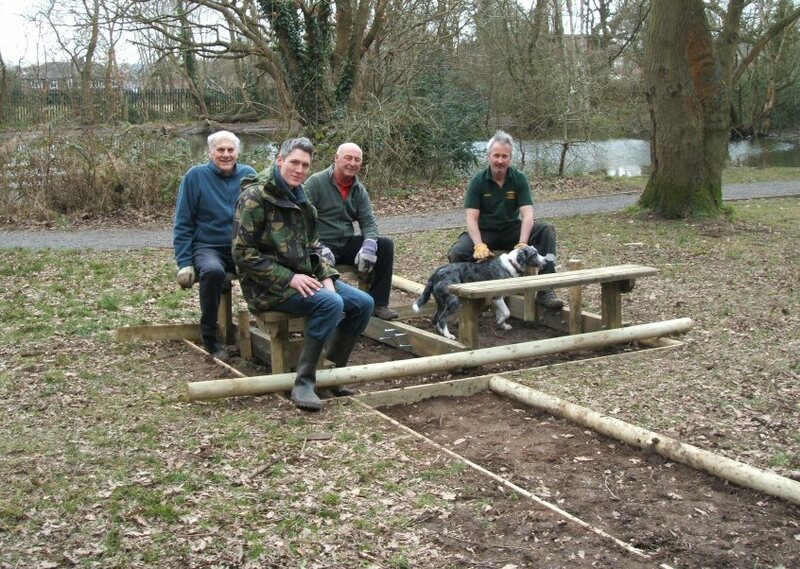 We have also installed a second picnic bench, with wheelchair access, close to the car park. Work on the pond to protect a wildlife area and ongoing attempts to reduce the risk of algal bloom has also been carried out. April and May have been busy months with a good deal of work being undertaken to complete the programme of railing construction and path improvements. The Team are starting to get quite proficient at driving in the posts and attaching the rails. Some of the rails are really very hard wood and driving the 4″ nails through can be very trying as they tend to crumple and bend under severe force! The weather has not been kind with rain and cold a regular feature – however on the bright side the Spring flowers have been super this year. Other tasks have included clearing curly pond weed , which is a non-native invasive species, from the pond by Bodens Hey meadow. The overhanging rhododendron along the riverside path leading to St Patrick’s Well has also been trimmed back. The roots of these bushes anchor the valley side so removing them entirely would probably lead to excessive erosion. 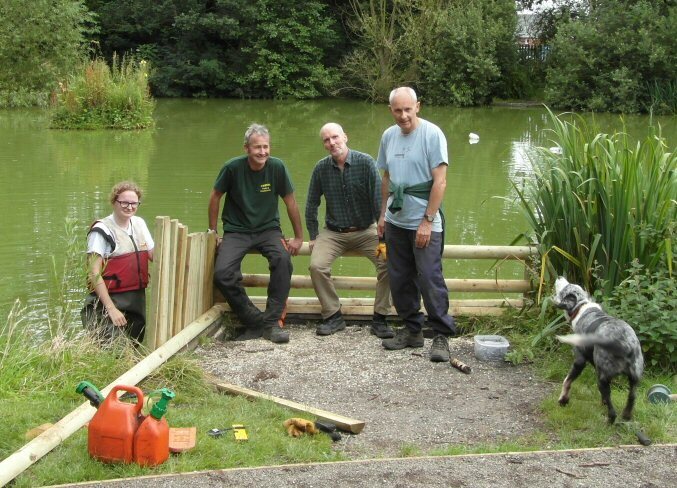 This week, under Alan’s guidance, we undertook the installation of a fence across the NE corner of Woodslee pond to provide a protected area for wildlife and an area suitable for fish to use when spawning. Driving the fencing posts in whilst squatting in the tiny dingy looked most precarious – so well done to George and Alan for that! The picnic table jointly funded by the Friends and North Wirral Rotary Club has been installed and is now being regularly used which is nice to see. If we get some sunshine I am sure it will be a great spot for a picnic. Beautiful weather, sunshine, rain free and not too cold despite a hard frost over night. Most of the day was spent preparing the base for a new picnic table that is being installed on Friday( with the help of North Wirral Rotary Club members). However today we cleared an overhanging branch or two and then marked out the base area. This was then fitted with a low wooden revetment border and the surface turf removed to provide a suitable base for membrane and gravel to be laid. 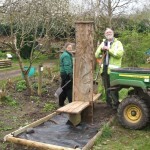 This will give a suitable all weather surface for the table and enable wheelchair access. The handrail has been completed. On the 27th we had snow showers throughout the day but luckily none settled enough to interrupt the work. The following day was dry and considerably warmer. In addition one of our best patches of wild garlic was cleared of brash and twigs from a fallen tree. Several young trees were also given new supporting stakes. These stakes are set at an angle and quite low down – this is to provide support to stop the root ball rocking but at the same time allow the main stem to flex in the wind and so strengthen naturally. The main morning task was to fill in pot holes in the car park and on the drive. 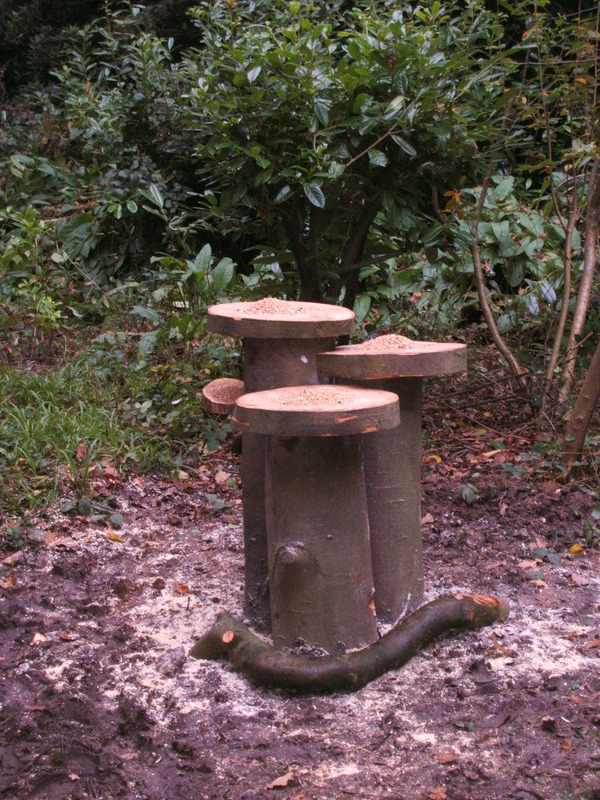 A large fallen branch almost blocking a path was cleared and anti-squirrel baffles fitted to protect the bird feeders near the disabled parking area. 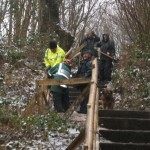 In the afternoon work started on building the hand rail on the “39 Steps”. Actually there are just a few more than 39 since they were renewed last year but the name stuck. 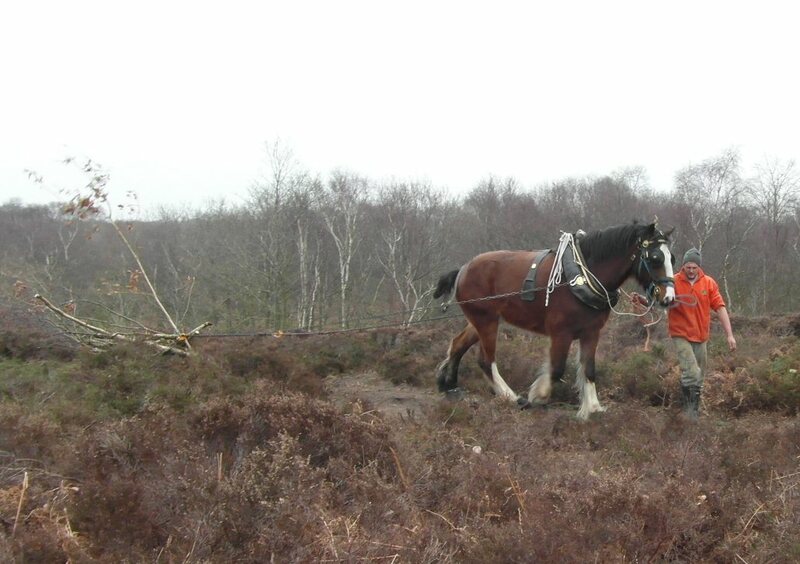 The team went to Royden Park to help with the clearance of cut trees that were being removed from heathland. 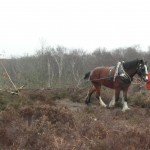 If the trees are not removed they encroach on the heath and reduce the heather growth. In the afternoon we were joined by a delightful shire horse, called Dan, that worked at pulling the bundles of brash off the heath – making it look effortless. A very pleasant day. Beautiful weather for a change. The handrail for Otters tunnel steps was completed and the preparation for the asphalt surfacing of the small car park was also finished. Everybody enjoyed the day. Well it wasn’t raining for a change, it was snowing instead. 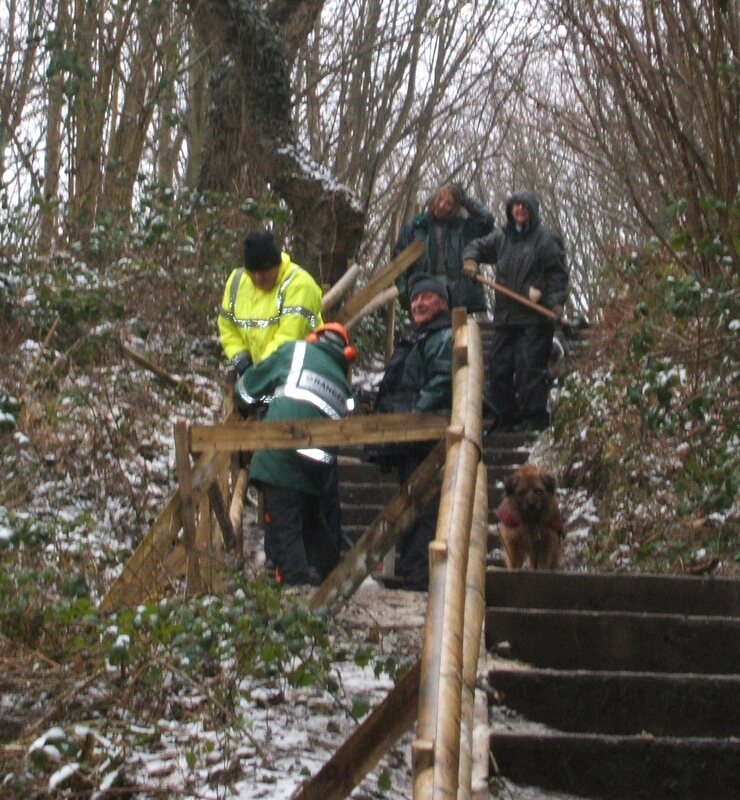 This inclement weather did not however put us off continuing the task of building a sturdy wooden railing beside the steps that run down to Otters Tunnel. 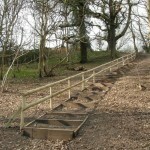 The work included putting in the posts and rails, adding bracing posts (the diagonal ones shown in the photo) and making the hand rail more robust. We all got ‘stuck in’ and despite freezing wet fingers managed to get the majority of the work finished and were very glad to retire for a late lunch! Quite a bit of work has been done, by Alan and the other volunteers, on clearing the slope down to the river and this has opened up the view considerably. To make the most of this we have lowered the railing opposite the bench to give an unrestricted view down to the river and willow carr area. The following day the weather was beautiful and felt springlike. The Thursday crew did some sterling work on clearing paths and planting oak seedlings. A nice day but with a distinct chill in the air. The main task for the day was preparing the small parking area near the Visitor Centre for tarmac to be laid and proper disabled parking bays to be marked out. This will complete the project to enable access for all to the Woodslee Pond area. Some new bird feeders were also installed close by so that those unable to reach the feeding area in the dell would hopefully be able to see some of our wildlife from the disabled car park. A very satisfying team effort enjoyed by all. Late January 2013 After the Winter Warmer, which we all enjoyed, we spent our next session restoring the place to normality – but we left the decorations up until 12th Night. Since then a lot more rain has fallen and the paths are becoming increasingly muddy. We are busy clearing drains and making new ones to try and keep the mud at bay and also putting new surfacing material down to try and consolidate some paths. We have also been burning a lot of chopped rhododendron branches and stumps – and ended up smelling like a kipper! Last week we had some snow (only light compared to some) but we went out in it to thin a patch of ash seedlings, leaving a few healthy looking ones. We really hope we do not get the Ash dieback disease or our efforts will have been in vain. 5th December 2012 With the Winter Warmer event only three days away , all activity focused on preparations. These included ensuring the gas BBQ was working, building outdoor shelters for stalls and the BBQ itself. Tasks included making signs for the car parking and for route to the Visitor Centre as well as getting the decorations sorted and final preparations made for the setting up of stalls on Saturday morning. We also gave the hazel and holly bushes around the courtyard entrance a good tidy up . This kept all of us quite busy – but looking forward to a good fun event. The weather forecast for Saturday is not bad – so fingers crossed for a great day. Despite the poor weather we have managed to get out and about during November. The work around the pond is now completed. 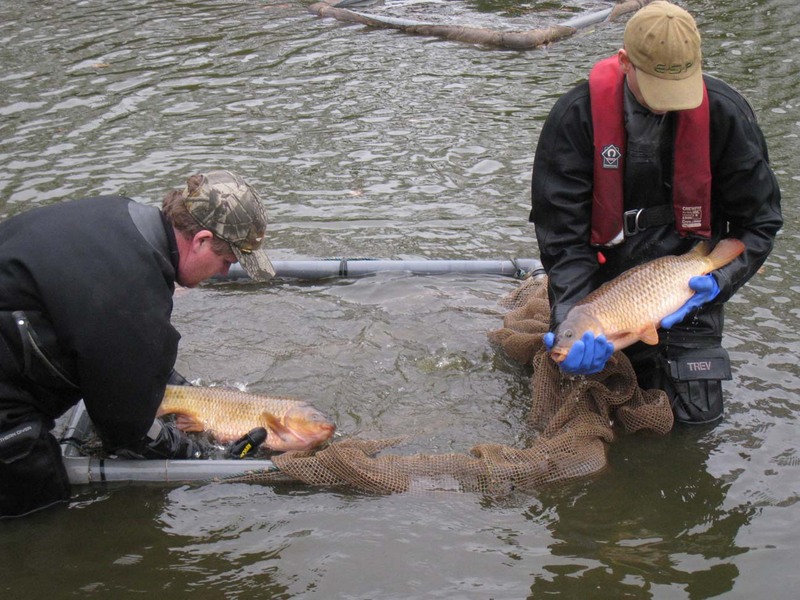 The stock of fish in the pond was again checked by the Environment Agency and they removed several pike – to help rebalance the mix of large, medium and small fish. 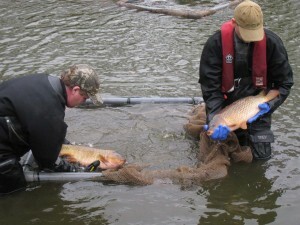 Other fish were then introduced including about 200 each of perch, tench and carp. Interesting to see – but not much work done by the watchers. The main thrust of the work this month has been coppicing in the area by Otters Tunnel. 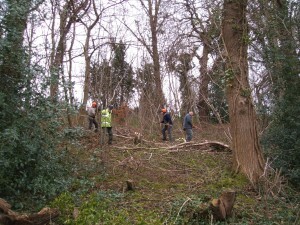 The hazel trees are cut back to almost ground level. This gives us some long, poles for use elsewhere in the park and also encourages the plants to grow again – ready to be harvested in about 7 to 10 years. It also lets light reach the woodland floor and so encourages/ enables low level woodland plants to grow. Watch out for the Wood Anemone and Lesser Celandine next Spring. We have also done some work on path drainage – wellies no longer required to walk through the park – unless the river floods again of course! 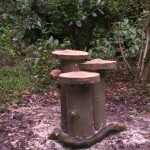 As part of a Friends sponsored project new bird feeding station has been established. The dell near the rangers office has been cleared and a series of bird tables and feeders introduced. Special thanks go to the members of North Wirral Rotary Club who came along and helped set up the bird tables, installed a second bench and cleared away some of the encroaching laurel. A rota for feeding the birds is being established as it is important to ensure that the feed is provided regularly. A local company has kindly made a donation to enable us to purchase an adequate supply of birdseed. Many thanks. The local birds are already enjoying their generosity. After an exceptional period of rain, which washed the shuttering off the bat tunnel, work resumed on the management of Woodslee Pond. The construction of the ‘inclusive’ fishing pegs is continuing apace. 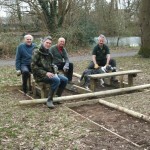 The picture shows Alison, Alan, Tim and David working on the first one several week ago. We are now on number eight. Last week we also transplanted* some shallow water vegetation, mostly bog-bean and flag iris, from a neighbouring pond to encourage and provide a refuge for some of the freshwater invertebrates that will help to keep the pond ecologically well balanced. * Prior to transplanting the vegetation the donor pond was carefully checked for any evidence of invasive species e.g. New Zeland Stonecrop and water fern, that are damaging some of our native ponds and rivers. All was clear! The Summer holidays are over and it’s back to work. Not that work stopped for that long in Dibby! We have had a busy time with two activity areas dominating the work, balsam and pond management. First, the annual Himalayan balsam eradication programme which ,dare we say it, does seem to be having a significant effect. The amount of balsam this year is much less than last year but small pockets of it did still crop up. There were also occasional single plants appearing in flower with which we had to deal. Each plant can produce several hundred seeds so even a few that escaped our notice could mean a lot more next year….. The second major area of work relates to the upgrading of the access and water quality in Woodslee Pond. This includes improving the access and fishing ‘pegs’ to enable wheelchair access for disabled fishermen (or women of course). 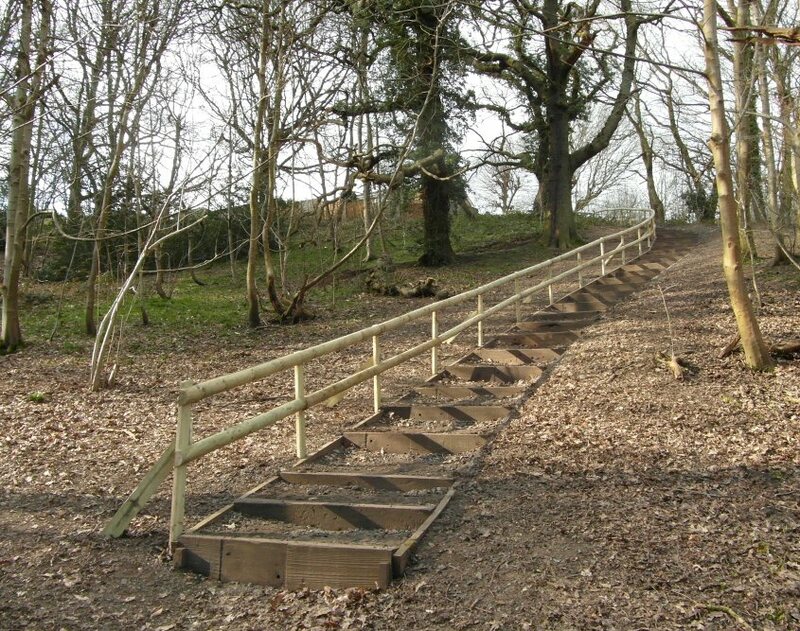 The path surrounding the pond is being widened and each peg is being provided with a suitable safety rail and adequate flat area for wheelchairs. Today we have completed the work on the fourth peg. The problems with blue/green algae have reoccurred and we initially places the recommended barley-straw ‘sausages’ in the water and these seemed to result in some improvement. The main cause of the problem is excess nutrients in the water. To address this the Environment Agency suggested the creation of floating islands with waterside plants which would effectively draw the excess nutrients out of the water. Two weeks ago they came equipped with all necessary materials and equipment to help us build three such floating islands. Constructing them, planting them up and launching them provided a full days enjoyment for us all. Last week we took the boat out to them to add some further plants. Here we are in the middle of Summer, and what do we get? Rain and more rain and that brings on the mud. Several folks have managed to get a boot-full of mud and on at least one occasion a lost boot in the mud. Does this stop us – No! The volunteers continue to turn up and work …. they are either a load of nuts or a great bunch – I think the latter. Quite a bit of path work has been undertake recently both to keep back encroaching vegetation (brambles seem to love the warm rainy conditions and grow like mad) and also improve access to Woodslee Pond for wheelchairs. We hear that the jet stream is now moving North – we really hope so! Bring on the sunshine. Himalayan Balsam bashing with some rain showers. (see Invasive species page) Contractors are on site tackling some of the main balsam sites using strimmers. However our volunteers, armed with brashing bars (they are like a bill hook on a stout 1.6m handle, quite heavy and quite effective), tackled the west river bank on the downstream side heading towards Spital dam in the morning. In the afternoon the dreaded weed growth in Patrick’s wood was addressed until the rain made the terrain unsuitable for further work (it is quite steep and slippery). A large Oak tree had fallen in the car park at Eastham Country Park (our sister site) and the team went along to help cut it up and clear it away. They also undertook some more work on the car park at Dibby to improve the drainage. Today was Car Park day. The enthusiastic team set about giving the car park a facelift, under Alan’s supervision. The area in front of the new notice board was levelled and given a gravel surface. 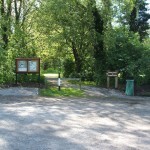 A new sign showing the way to the Visitor Centre and Rangers Office was installed and the edges of the parking area were scraped back and the surrounding bund tidied and re-seeded. At the end of the day we all agreed that it looked much smarter. Fencing along the drive is being replaced and this work has been progressing well. A display showing some of the friends activities and delights of Dibbinsdale was prepared. A lucky capture of wood mouse in a live trap enabled us to get some great pictures of the small mammal trapping process just in time for the display. On Sunday, 6th May we took the display stand to the New Ferry Butterfly Park open day to help support this excellent Wirral Wildlife project. We had a good number of interested visitors and even managed to recruit a few new members. 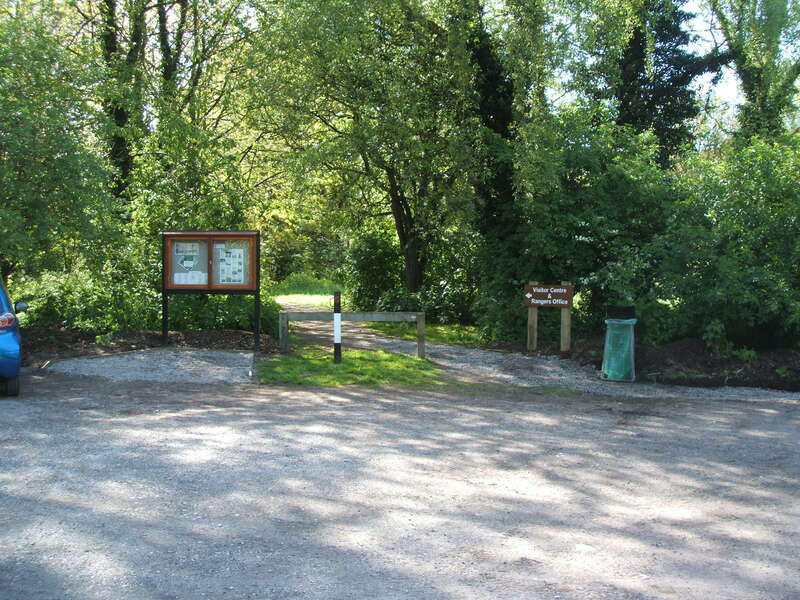 The Butterfly Park, located about two miles from Dibbinsdale, is actively managing a site that was formerly railway sidings and a brick making works to provide an environment for butterflies and other mini-beasts to find a home breed in an otherwise urban environment. Well worth supporting. Hey its raining! Lets go and clear out the drains. So we did – well three significant ones at least. These are drains that run under the paths in the reserve – without them they can get very muddy. Somehow we all ended up very muddy (havn’t I heard this before?) but the drains were running well. The wise ones decided to continue the fencing replacement. Pete prepared a set of wood samples to go on our stand at the New Ferry Butterfly Park Open Day (6th May). Despite rain and mud we achieved all planned tasks and felt that it had been an excellent day. Morning walk around the site with Lyn Byrne the Invasive Species Officer from Cheshire Wildlife Trust. Looking primarily at the extent of the Japanese Knotweed and Himalayan Balsam we have in the valley. We also had an interesting discussion about the crayfish the live in Woodslea Pond – unfortunately not our native species but the american signal crayfish. In the afternoon work on the replacement fencing along the drive was undertaken. Mud, Mud, Glorious Mud. You know those willows we felled on 28th… well today we were winching out the stumps and roots. It had been raining and the area was quite wet when we started, but after a few hours of tramping around we ended up with a wonderful mud wallow, about a dozen uprooted stumps, as well as some rather tired and muddy volunteers. The rain held off, it was sunny and all agreed that it had been really good day. First apols for the absence of the diary for a few weeks – IT problems!! Glorious sunshine today, just right for the work we were doing clearing some encroaching willow in Babb’s Meadow and reinforcing the river bank with willow spiling – which should grow into a robust riverbank in due course. We also repaired some of the drainage gullies between the pools and the river. This is to encourage the growth of a healthy reed bed. Another good day in the woods for our team. 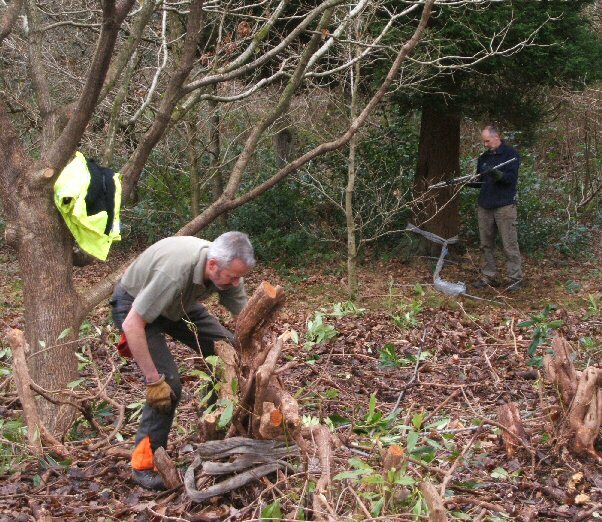 Today we did some final work on the rhododendron in babs meadow removing the last of the stumps and raking the brash. We also cut back some of the trees and branches infront of the owl box to encourage nesting owls. In the afternoon, we worked around the tunnel installing reflective discs to help guide people safely through the tunnel and repared the fence at the south end of the tunnel. Work today centred around the courtyard and visitor centre again. The group split up into small teams looking at different tasks. One group made an owl box which we plan to put up in the reserve asap (next week would be good). A cutting list was made for materials needed to bring all the fishing pegs and paths around Woodslee pond up to Wheelchair standard. The materials for this project will be funded by the EA and the labour provided by our volunteers and local company environmental volunteer days. Work also continued on clearing unwanted cover along the driveway. Today we had a collaborative work day with a group from the Association of Wirral Anglers, our own Wednesday volunteers and a small team from the Environment Agency Fisheries department. The task was to net the pond to see what fish were in there. This was to ascertain the quality of the water and ensure a good balance of fish stock for anglers and future wildlife management in the pond. 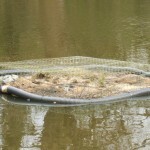 A large amount of small roach were removed as it was decided that the pond could not sustain them at the level present. 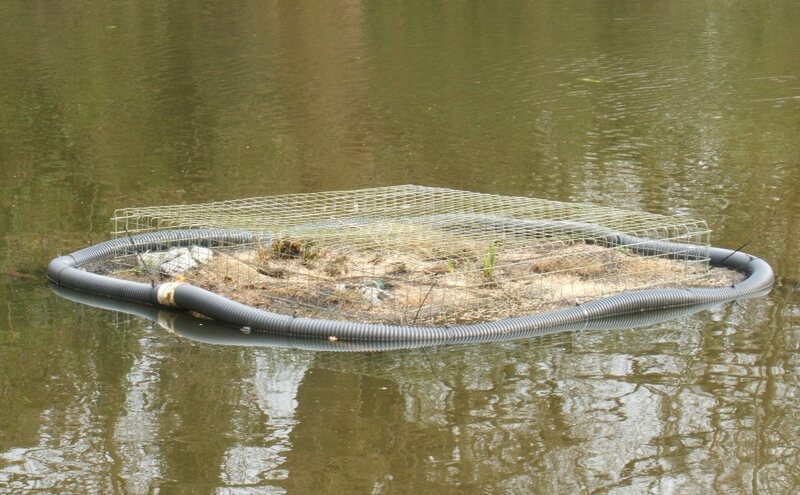 We also made some plans to have some habitat maintenance task days on the pond with the EA in April. Once again we focussed our activities on the Visitor Centre and surrounding area. New fencing was erected on the road to the Rangers Office. The Visitor Centre notice boards had a lick of paint and a thermometer was affixed to the wall by it centre door. On the following day the timber store was unloaded and stacking supports built. The video lead from the nest box camera was repaired – it had been nibbled through by mice! We also got to work and made up the nest box kits for use on Saturday. Overall a couple of quite busy days. This week we focussed our activities on the Visitor Centre. The leaking roof has been fixed and it is now open to the public again. There are plans to make much more use of it this year for demonstrations, courses and meetings. A good deal of spring cleaning was undertaken and old clutter cleared out. We also started putting up the new signs directing folks from the Car Park to the Visitor Centre. Cold, fresh and bright – a great day for some serious work outdoors! One of our special trees a Holm Oak (Quercus ilex) was becoming masked by undergrowth and an adjacent leaning cypress tree. The task for the day was to clear the undergrowth and remove the cypress. We also pruned off some low dead branches from an adjacent oak tree. The end result justified the team’s efforts revealing the superb natural sculpture of this fascinating tree. This species of oak was originally from the Mediterranean area and unlike our native oaks it keeps its rather prickly leaves throughout the winter (as can be seen in the picture). An interesting meeting and discussion about the development of countryside skills started the day. We then set about clearing the vegetation obscuring our largest Monkey Puzzle Tree – correctly called a Chile Pine (Araucaria araucana). 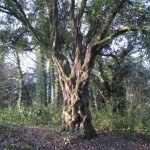 These distinctive but rather short lived (100 years) trees were introduced into Britain in 1795. The tree is now easily spotted from the path leading to the Rangers Office. 1) Clearing out the Bodgers shed in the walled garden – the Friends are looking at making this available as an outdoor crafts facility available for a whole range of woodland based activities including using our pole-lathe. 2) Undergrowth clearance from around our Coast Redwood tree (Sequoia sempervirens) to give it space to grow and be visible from the path by the carpark. Now easily spotted as it is just about the tallest tree around and has rufous spongy bark. 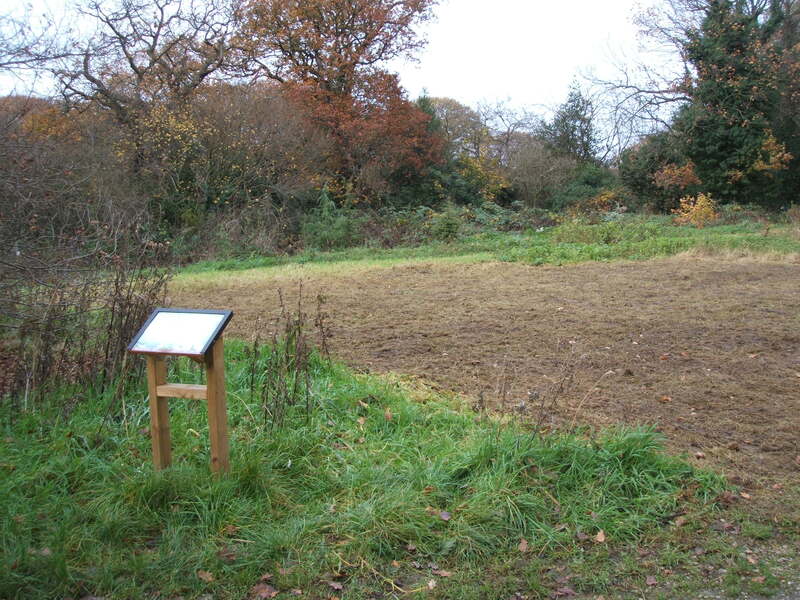 3) Continued management of the laurels between the Visitor Centre and the wildflower meadow. The rain never really got started and it was a satisfying day for all who came along. An oak tree by St Patrick’s Well had toppled over creating an unusual but unsafe arch across the path. This was quite a challenge to remove safely but with Alan’s expertise with the chainsaw it was reduced to a series of short but hefty logs that were then used to extend the existing pathway edging. 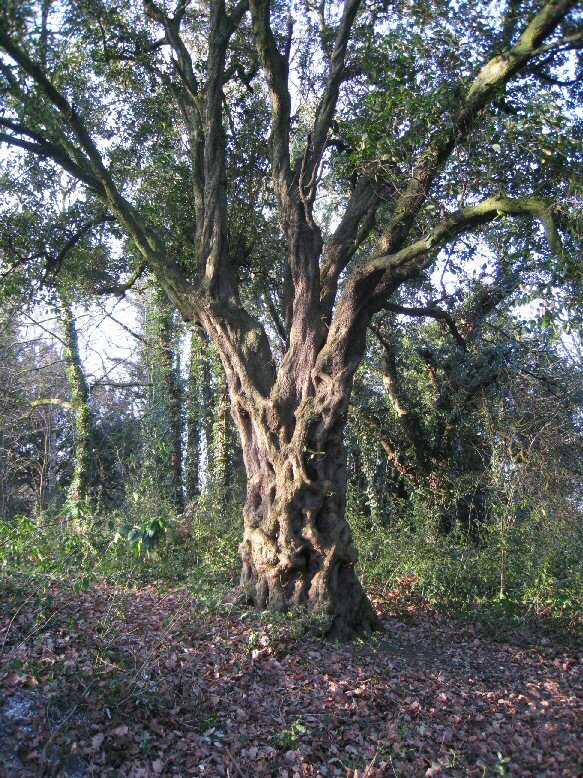 Work was also undertaken to remove an unsafe Holm Oak near the Ranger’s Office and the opportunity was also taken to coppice the trackside Hazel and prune the other, largely laurel bushes to open up the view to the flower meadow. stakes to use for traditional hedging and other country crafts. The stakes can be up to 3 meters long and are relatively straight. The Hazel plants themselves are not destroyed and produce new shoots suitable for harvesting in a few years time. Here we see Alan, Pete, Gary and Phil hard at work! Dave,Tim and Ron were also doing their share out of camera. 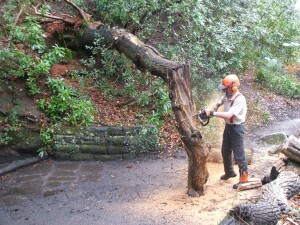 The afternoon was spent winching more of the extensive rhododendron stumps from the ground. We managed to get about six uprooted and ready for removal. All in all a good day despite the indifferent weather. 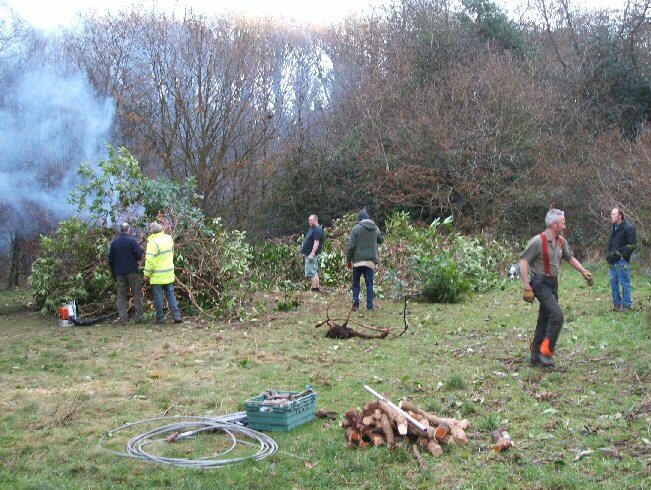 The major task was once again clearing and burning the invasive rhododendron, in particular the gigantic specimen that dominated the area adjacent to Babb’s Meadow. We have now removed about 75% of it but still need to work on the remaining stumps and roots. A heavyweight winch is used to literally pull them out of the ground – but it is still really hard work getting them to start ‘lifting’. Pictures of Alan and Tim preparing to winch out another stump and the fire with the pile of material to burn. The enormous amount of removed vegetation is burned – getting the fire going well enough to cope with the dampish material is sometimes a bit of a challenge. 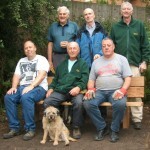 The major task for the day was the assembly and installation of a new outdoor bench overlooking the wildflower meadow. 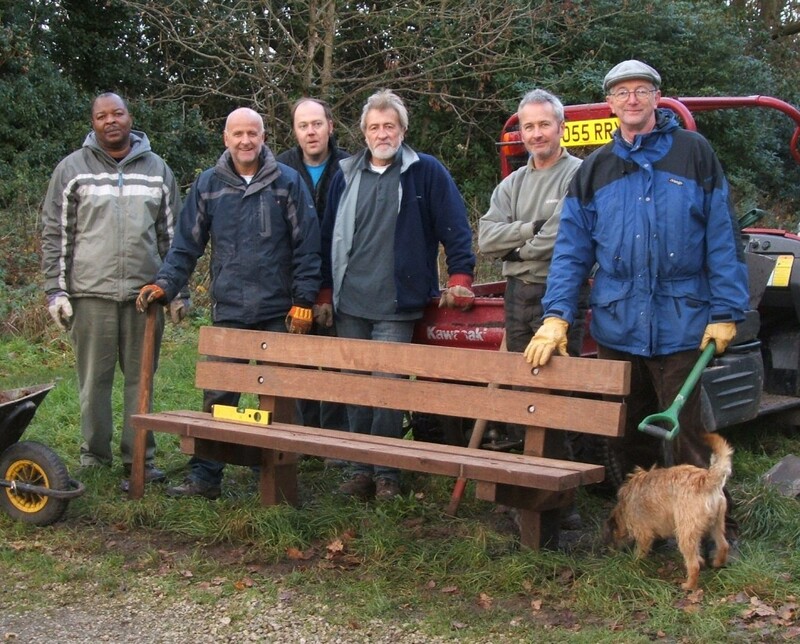 The bench has been provided by the Friends of Dibbinsdale and will enable our park visitors to sit and take in the views across the meadow and later in the year enjoy the display of flowers. Special thanks to Phil and Gary who did the bulk of the work digging the rather deep holes that were required. Later a party went litter picking and recovered a depressingly large amount of rubbish whilst a small ash sapling was felled and used to prepare Xmas decoration bases for the forthcoming event at Eastham Country Park (our sister site). We also had to help remove a large oak branch that passing jogger told us had fallen across a pathway. Path clearing of fallen leaves. Wildflower meadow mowing and removal of material in preparation for next years seed planting. The removal of the cut material helps reduce the soil nutrients and so help the flowers compete with the grasses next year. Path maintenance – removal of encroaching grass. The leaves are really coming down now so further path clearing was also required later in the week.